Perdido Skye, a quiet, therapeutic place to share sun and fun with family and friends. 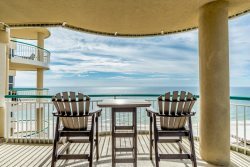 This affordable condo is directly on the beach with amazing views from your large beachfront balcony. Youth-size captain’s bunks built into the hallway allow extra sleeping for children. This 700 SF, 4th floor unit overlooks the large pool and has ceramic tile throughout. Electronics include 36” Flat screen TV, DVD in Living Room and a 30" Flat screen TV in Bedroom. NOTE FROM THE OWNER: Welcome to your home away from home. We really enjoyed our stay at Perdido Key. We were at another hotel that was awful. My nephew was staying at Perdido in a condo, so he gave us the owner's contact info to see if she could hook us up with a one bedroom condo, and she did! The owner, Michele Stearns, was fantastic to us. Every discount she could give us, she did! Our Perdido Key condo stay was in a very clean and affordable 3rd floor unit right down the street from my nephew and the rest of my family. Kitchen was fully stocked with everything I needed to cook, just as if I were at home. Plenty of towels, very clean, very comfortable, we were very very pleased!